A Partnership Between Hospital And Campus Helps Students Through A Breakdown : Shots - Health News A partnership between a mental health care provider and colleges is redefining emergency mental health care on campus – helping students get needed care without losing track of their academic goals. Sometimes a psychiatric crisis can be triggered by something small. For Alexia Phillips, 21, it was a heated argument with a close family member in February 2017. She remembers the fight blew up before she left the house to go to classes at Queens College in Flushing, New York. By midday, Phillips, then a sophomore, says she began to cry loudly and uncontrollably. "It really triggered me. I just got really angry really fast...I was crying so much I couldn't breathe and couldn't talk. I didn't know how to handle it," she says. As she would come to understand later, Phillips was experiencing symptoms of her underlying borderline personality disorder, anxiety and depression. But at the time, all she knew was she felt too overwhelmed to go home, or to go to class. She also didn't want anyone to see her like that. Finally, she went to her college counseling center for the first time and asked for help. Minutes later, Phillips' counselor, a college public safety officer and a paramedic trained to deal with psychiatric crises, calmly and unobtrusively escorted her to the back of the college through a quiet hallway door that led out to a parked ambulance sent from Zucker Hillside Hospital. She was ferried — without the lights or sirens — to be assessed at the hospital's special program for college students. This kind of response to a student crisis is unusual. In a lot of colleges, if staff think the student who's having a crisis may be unsafe, they have little choice but to call 911. Many schools lack resources to address serious crises and students are left to navigate the health care system on their own. But Queens College is part of the Behavioral Health College Partnership, an innovative mental health program run by Northwell Health, a health care system in New York, in partnership with more than 77 colleges in the New York metropolitan area. The program provides behavioral health care tailored to college students' lives, including emergency evaluations, counseling, and inpatient treatment. Laura Braider, a psychologist and director of the Behavioral Health College Partnership says she launched the partnership in 2009 with Blaine Greenwald, a psychiatrist at Northwell Health because she wanted to create a more therapeutic approach to handling student breakdowns. "We saw a lack of ability to effectively treat college students in need of care These students are not adults and not children and need specialized programming to meet their needs," says Braider. Their approach starts at the moment of crisis — avoiding that 911 call which Braider says can be mortifying for students — and extends through inpatient care if needed, including support for the transition back to campus. It's designed to make it possible for students to get treatment and then reintegrate into their academic life with as little disruption as possible. "We try to minimize any secondary trauma to students who are already overwhelmed," says Braider. More than 3,200 students have been admitted to the program since it began. For students who need inpatient care, the program has a special unit at Zucker Hospital — a friendly dorm-like environment where students can keep a sense of normalcy as they stabilize. Dr. Marta J. Hopkinson, a psychiatrist and director of mental health at the University Health Center at the University of Maryland in College Park says specialized programs like the Behavioral Health College Partnership fill an important void for college students. 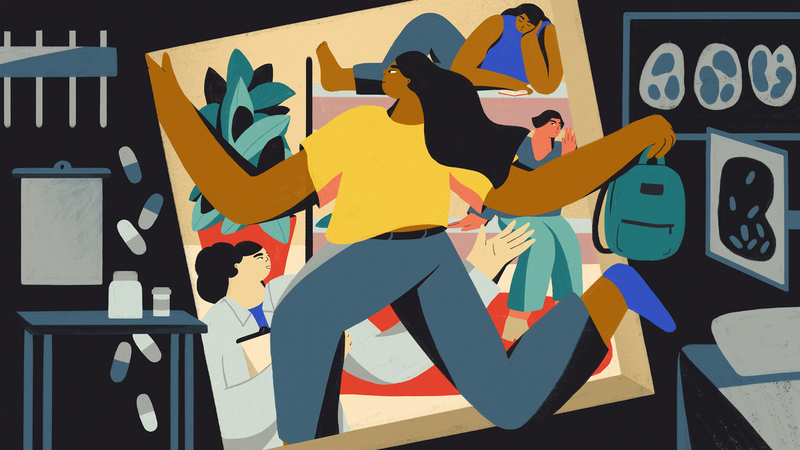 "Most schools can't expand enough to meet the demands of all the students who want and need psychotherapy," she says. "We're all working to prevent these kids from falling through the cracks." But colleges often struggle to provide effective treatment options, says Randy P. Auerbach, an associate professor in the psychiatry department at Columbia University College of Physicians and Surgeons and lead author of the study on the prevalence of mental disorders. "Only a minority of students are seeking out treatment, creating a conundrum on campus," he says. "Lots of administrators everywhere are scrambling to find innovative ways to reach students in need." Typically, when college students need acute hospitalization for a psychiatric problem they're put in psychiatric services with other adults with serious mental health problems. These can be "fairly frightening places" says Dr. Victor Schwartz, the chief medical officer at The Jed Foundation, a nonprofit that supports campus efforts to improve mental health services and prevent suicide. "They can be particularly upsetting for a college kid with transient problems or in the early stages of a mental illness," he says. In contrast, the Behavioral Health College Partnership treats students at a specialized hospital unit within Zucker Hospital that's only for young people. It looks and feels like a dorm. Patients have double rooms where they can settle in with their favorite stuffed animals and other comforting items. There's a common area with TV, an exercise bike, a ping pong table and a piano. Students can grab snacks and beverages any time, and they eat together in a lunchroom environment. Arriving in this environment was a welcome relief for Alexia Phillips after her crisis. She had never been in a psychiatric facility before. "All I knew was what I learned from movies I saw about it so I was terrified," she says. But once Phillips got settled into the specialized college wing, she says she enjoyed it. "It was more like being in a college dorm," she says. "Everyone was really nice and I made friends there. The kids were all like me. We could talk openly about how we felt." More importantly, Phillips, who had been going to outpatient therapy for being bullied and for cutting before her psychiatric crisis, was relieved to finally get a diagnosis for her problems. She started into dialectical behavior therapy, known to be effective for borderline personality disorder and mood disorders. "I got good therapy and good medication," she says. Many colleges will refuse to take back students who have a suicide attempt, because of liability concerns. And being out of school to get treated for a mental health crisis can set students back academically; some will struggle to get back on track to finish their school semester. To prevent this, the Northwell mental health partnership focuses on family and school engagement, staying in touch with the school counselors and administration throughout the treatment process. It starts when a student is being transported to the hospital; their college prepares and sends a history of the student, including any substance abuse, past psychiatric treatment and other risk factors for suicide. "Without collateral material from the school we're not seeing the big picture," Braider says. Braider believes allowing "communication to seamlessly flow" between the hospital, college, the student and their family during hospitalization benefits everyone. And, colleges respect their assessment of the student's readiness to return to campus life. "Once the hospital gives us their report when a student is released saying that the student is well and ready to be integrated back into school we accept that. We work hard to get the student back into school," says Dr. Barbara Moore, a psychologist and director of Queens College Counseling, Health and Wellness Center which has been involved with the mental health partnership since 2011. When the student is stabilized, a liaison contacts all the teachers and works out a protocol for what how they can catch up academically. Not every student comes right back, however. If they missed too many classes Moore says she might encourage a student to take an incomplete to make up the work without pressure. "We try the best way we can to figure out a transition that works well for them," she says. The partnership's approach worked well for Damian Escobar when he had a serious crisis in November. Escobar, 18, a freshman at Hofstra University in Hempstead, New York, says he became "really stressed" trying to keep his grades up to retain his scholarship. Escobar, who had been already diagnosed with depression and anxiety before he began college, had failed to keep several appointments at Hofstra's counseling center. "I went to classes and just sat there. I wasn't doing anything. I was too depressed to talk about my issues," he says. He felt he couldn't talk to his mom about it. Eventually, Escobar began having suicidal thoughts and attempted suicide. Escobar heard about the program and his mother and grandmother drove him to the collegiate unit at Zucker Hospital. He received daily therapy and was involved in family meetings and coaching. About 10 days later, he felt ready to get back to school. Before being released, he worked with the partnership's college liaison, Danielle Cimafonte, to figure out how to relieve some of his stress. He dropped one of his five classes without penalty and is back at Hofstra. "When I came out of the hospital I was like a completely changed person. After my treatment and new medications my mood became completely different," says Escobar. His depression made him shy and sheltered. After his hospitalization he went back to school and back to being the "loud and open like the guy he used to be." It worked for Alexia Phillips too, who went back to school after her stay at Zucker Hospital. She says she feared the medications she was prescribed on the unit would turn her into a zombie. "But I'm just the same way I was. It's just helping me with my depression," she says. It has been a year that she stopped cutting herself.